Wondering how to make sense of the alphabet soup of trainer certifications? Use this guide to compare them and make the most out of whichever one you choose! Personal training is an unregulated industry. This means that your 90-year-old grandmother can be a trainer. So can the guy beside you, or even someone who just started training. All they have to do is convince someone to pay them for their services. You want to be a trainer, but you don't want to be one of those trainers. So what's the answer? A certification, of course! After all, most gyms won't hire you without one. If you're independent, many insurance companies won't cover you without one. It's your foot in the door. But is a certification really worth your time and money? I would argue that it is—as long as you know both what you're getting and why. You need to go in with your eyes wide open, not just your wallet. 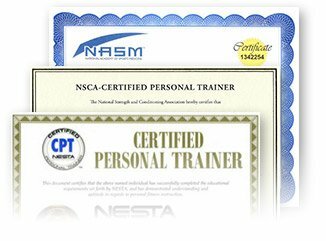 Below, you can see a complete table of all the personal trainer certifications in the US for you to compare. But before you check them out, absorb the following truths to make sure you get the most out of whatever certification you earn. Sure, a client might nod their head when you extol the benefits of your certification, but in most cases they've got nothing to base their opinion on. There are exceptions to this, of course, such as people who will come to you specifically because you've been certified in specific styles of, say, yoga, kettlebell training, or powerlifting. But even in these cases, clients care more about the results you can get them. "No matter how good you are at sales and marketing, your success or failure is ultimately dependent on the results you help your clients achieve." Don't forget that. No matter how good you are at sales and marketing, your success or failure is ultimately dependent on the results you help your clients achieve. The best personal trainers are those who have the combination of knowledge and passion to provide high-quality service. A piece of paper doesn't give you either of these. Trainer and author Dave Parise made a great case in his book "Certified Vs. Qualified" that those two terms are far from equal. Let's be frank: A certification won't prepare you for training clients. In order to do a great job—not just an adequate job—you have to accumulate tons of practical and varied experience. That may sound daunting on the front end, but in reality it's no different than any other profession. An accountant isn't ready to take on a wide variety of cases right away. Upon graduating and getting a job, he or she ideally goes to work at a firm under the supervision of an experienced mentor. The difference is that personal trainers are usually thrown into the fire immediately when they start. There is little chance that a new trainer will be ready to train a 15-year-old guy wanting beach muscles and a 70-year-old woman with arthritic fingers and a torn ACL back-to-back on day one. I'm not dismissing your years of experience working out and reading fitness websites and magazines. They're important. But their value is also very narrow. Up until now, your research has likely been focused upon making your workouts better and healing from your injuries. Unless you're going to be training people exactly like yourself—which isn't likely—you'll need to work to learn new methods. In addition, you're likely so far removed from being a beginner that you've forgetten how it feels to be uncomfortable and unconfident in the gym. This point is so important it took up the entire first chapter of my book, "Ignite the Fire: The Secrets to Building a Successful Personal Training Career." There's a manager or mentor who supports you and allows you to ask questions. You get the opportunity to get your hands dirty and work with a variety of different clients. That's a great place to start. Just remember that it's always OK to say you don't know something, as long as you follow it up with, " ... but I'm sure as hell going to find out." Remember what I said above about personal training being unregulated? That doesn't just mean that anyone can be a trainer. It also means that anybody and their dog can create a certification for fitness professionals. You don't need to be a trainer for long to happen across certs that have little of value to offer. It's perfectly normal to become skeptical; in fact, I recommend it. In many cases, the best choice is to avoid expensive certifications and put your money toward books, workshops, conferences, mentorships, and internships. Some of these come with certifications, but many don't. "Seek out the best resources on whatever topic you're interested in, and don't be cheap when it comes to your education." Seek out the best resources on whatever topic you're interested in, and don't be cheap when it comes to your education. If you're really planning on doing this as a career, it's OK to invest heavily in your education. Just don't worry about whether or not it has a certification tag attached to it. CEUs or CECs are continuing education credits. As you'll see in the chart below, most certs require them for renewal. A major source of income for certifying bodies comes from providing training courses and materials that are preapproved for CEUs. Some of these materials are worthwhile, but many aren't, so don't get sold on the preapproved CEU tag alone. Here's what you might not know: Almost every cert allows you to petition for CEUs from outside or unsanctioned events. This means that any event you attend or any course you take can count toward your renewal quota. All you need is a certificate of completion with the number of contact hours. You then fill out a form from your certification body. Attend a seminar because the topic is something that you want to learn about, and because you think it will help your clients. If it really will, then it's worth your time and money. When I called a cert a "foot in the door," it may have sounded like I was saying the content of the certification itself is more or less useless. Not so! When you register for a certification, recognize that an expert has taken the time to consider the methodology, gather all appropriate research, and combine it together into a system for learning. All of this saves you time, which is your most valuable asset. "Simply going through the process of learning their system, and being able to pass a test proving as much, gives you a foothold in an industry that is suffering from information overload." You don't need to agree with that person or their organization's stance on everything—no one does. Simply going through the process of learning their system, and being able to pass a test proving as much, gives you a foothold in an industry that is suffering from information overload. It's often hard to figure out what to do with what we learn. Consider this your place to start. Where you go next is up to you. So What Is The Best Cert For Trainers? Here's where I give you the answer to the question that's been on your mind since you started this article. Unfortunately, the answer is that there is no "best" certification. I've yet to come across any cert that truly stands out. Having spent $10,000-$15,000 on my education each year when I actively trained clients, my best recommendation is to views certs as stepping-stones for knowledge acquisition. Below is a chart comparing the major certifying bodies. Let me be clear at the outset that I have no affiliation with any certification. I run the Personal Trainer Development Center, an independent blog dedicated to the improvement of the fitness industry—as well as its perception in society at large—and the success of the passionate trainers. I share information about personal training because I love this industry. The only way to offset the scary rise in obesity and health care spending is preventative care, and there's no better preventative care than exercise. Make it your life, educate yourself, and make a difference! Jon retired from personal training to focus on helping other trainers expand their reach through the Internet and social media.